and your Friend will receive a Discount! As a Torrid Technologies customer**, you can earn big rewards for your referrals. The process is easy. Simply refer your colleague using the form below. If they discover that our software is for them, you'll receive a credit, and your friend will receive a $ discount off their first purchase. Everybody wins! 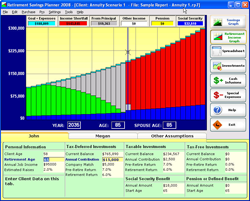 ** This credit is only for referrals that subscribe to the "RetirementView - Professional Edition" software. Torrid Technologies partners and affiliates are not eligible for the Torrid Tech Customer Referral Program. Partners and Affiliates will be compensated according to their respective agreements. Participation in both programs simultaneously is not permitted. I acknowledge that I have read and agree to be bound by the Terms & Conditions for the Torrid Technologies Customer Referral Program and the Torrid Technologies terms of service. All current Torrid Technologies subscribers in good standing can participate in the Torrid Technologies Customer Referral Program. For every new, valid Torrid Technologies subscriber that becomes a RETIREMENT SAVINGS PLANNER - PROFESSIONAL EDITION customer within 12 months of date you submitted this form, you will receive an account credit equivalent to one month's service charge or $100 depending on whether you are billed monthly or annually. The credit will be applied to your software subscriptions, but not to monthly fees for extra user accounts, overages, client reviews, or any other fees that are not part of a regular subscription. New valid subscribers cannot be an existing Torrid Technologies user, someone who has a terminated Torrid Technologies account within the last 3 months or was previously referred to Torrid Technologies by another person. If the lead is already in the system and has been worked by a rep in the last 18 months, the referring customer does not get credit. Obviously if one of our sales reps are already in contact with a potential customer, your referral will be helpful but will not receive a credit. All referrals must be entered at http://www.torrid-tech.com/refer. It is the referrer's responsibility to ensure this form gets filled out correctly for the referral tracking to take place. Referrers must enter their full name, email address, and any additional requested contact information. Referral credit will be tracked back to the referrer's account by email address. All referred subscriber's records must indicate the referrer's email address at the time of purchase. No exceptions. Customers who are enrolled in any of Torrid Technologies's partner programs will not be eligible for the Customer Referral Program. They will be bound by the terms & conditions of their partner agreement. Torrid Technologies employees are not eligible for the Customer Referral Program. Torrid Technologies employees will be bound by the Employee Referral Program. You may accumulate up to 12 months of credit. Credits will appear in your account and will be displayed until used up by your account activity. No spamming or bulk emailing is allowed. You may only send a referral email to people that you personally know. Any unsolicited sending of a referral email in volume may result in the cancellation of your Torrid Technologies account and any outstanding credits. Any attempt to fraudulently take advantage of the Torrid Technologies Customer Referral Program may result in cancellation of your Torrid Technologies account and any outstanding credits. Torrid Technologies credits have no cash value. Only credit will be applied to your account. Credits will be forfeited and terminated should your account be terminated for any reason including voluntary account closure. Torrid Technologies is not responsible for any incorrect or inaccurate information supplied by customers or referred friends while participating in the program. Credits will appear in your Torrid Technologies account 30 days after the referred subscriber has subscribed for a Torrid Technologies account. Your account must be active and in good standing. Torrid Technologies reserves the right to change or discontinue this program at any time. All changes will be posted on the website. Any questions regarding the Torrid Technologies Customer Referral Program should be addressed to: referrals @ torrid-tech.com (remove spaces before emailing).